Edward John Moreton Drax Plunkett, 18th Baron of Dunsany, was born in 1878 to a wealthy family whose title is the second oldest in the Irish peerage, dating to 1439. Growing up, he split time between London and the family properties in Shoreham, Kent and Dunsany Castle in County Meath and was educated at Cheam, Eton, and the Royal Military College, Sandhurst, which he entered in 1896. 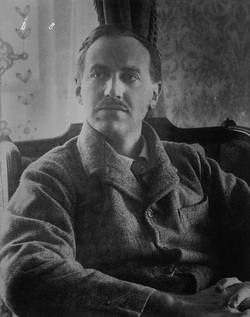 Dunsany was an extremely prolific writer, producing a body of work comprising some eighty volumes in various forms, including short stories, plays, poems, novels, nonfiction, and autobiography. His earliest published works were poems contributed to periodicals in the 1890s, and by 1905 his first volume of short stories, The Gods of Pegana, appeared. In this volume and in several more collections of stories and plays published over the next few years, Dunsany wrote within the fantasy genre, many of his tales focusing on an invented pantheon of deities who dwell in Pegana. These early stories have been cited as influences on J.R.R. Tolkien, H. P. Lovecraft, Ursula Le Guin, and others. Dunsany’s first novel, Don Rodriguez: Chronicles of Shadow Valley, appeared in 1922 and was followed by two more well-regarded fantasy novels, both considered classics of the genre, The King of Elfland’s Daughter (1924) and The Charwoman’s Shadow (1926). 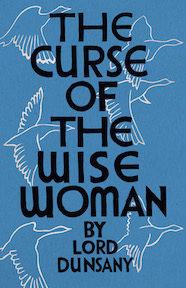 Among his later books, notable highlights include The Curse of the Wise Woman (1933), a semi-­autobiographical mixture of realism and fantasy set in late-nineteenth-century Ireland, My Talks with Dean Spanley (1936), adapted for a critically acclaimed 2008 film, and the Jorkens books, collections of short stories in which Joseph Jorkens, a middle-aged raconteur, would recount fantastic stories to anyone who bought him a whiskey and soda. Dunsany’s wide-ranging interests included hunting, shooting, chess, and cricket, and, despite his love of hunting, he was an advocate for animal rights. He was also involved in Irish literary circles and numbered Lady Gregory, George William “Æ” Russell, Oliver St John Gogarty, and W. B. Yeats among his friends. His other contributions to Irish literary life included major donations to the Abbey Theatre and championing the work of the poet Francis Ledwidge. Later in life, Dunsany transferred Dunsany Castle to his son and heir and settled with his wife, Beatrice, in Shoreham, Kent, where he continued to write and publish until his death in 1957 from an acute attack of appendicitis. Both popular and critically well regarded during his lifetime, Dunsany’s stature has continued to grow after his death, with most of his works still in print and his importance to the fantasy genre increasingly recognized, with Neil Gaiman, Guillermo del Toro, Jorge Luis Borges, Michael Moorcock, and many others, citing him as an influence.